Smash Your Training Plateaus, Overcome Injuries, Make Unprecedented Strength Gains and Grow More Muscle... with a Classical Education in the Wisdom of the Past and the Scientific Breakthroughs of the Modern Day Masters The fight for greater strength and muscle is the story of a constant struggle against conflicting forces... Since ancient times when strength meant survival to the more modern goals of competitive excellence and physical culture, we ve fought a never-ending battle with our own bodies to achieve and maintain maximum performance. Because our bodies don t want to change! And if we make them, they ll do their best to sabotage us! Let s face it... our bodies are reluctant partners in the strength game... Anyone who s been around the block, knows this only too well: The story of strength training is the story of constantly adjusting, constantly engaging in a guerrilla campaign of trickery and skullduggery against our obstinate bods. A small victory here, a setback there, a sudden breakthrough, another setback, another breakthrough, a long stalemate, another breakthrough... it never ends! And many of us simply give up from sheer frustration. We quit, when perhaps we could have stayed ahead... We become content to slough back into slackness and physical mediocrity... And that s mostly because we never got the education we needed to know how to win and keep winning the guerrilla war against our own bodies. Of course, it doesn t help, in this day and age, that we also have to fight the myth-mongering marketers of strength training half-truths, preying on our ignorance to make a quick buck out of the gullible... We have to fight against the machines, the gizmos, the quick fixes, the absurd claims and the downright foolishness of most of what passes for training advice in the magazines and gyms of our country. Fortunately, there is a solution to all the confusion, ignorance and uncertainty... When all else has failed you... Pavel has spent his life immersed in the study and practice of practical strength and muscle training... as it applies in the very hard testing ground of both American and Soviet Spec ops, of the US Marines, SWAT, professional athletes, martial artists, gymnasts, powerlifters, weightlifters, Olympic champions and numerous other tough, tough competitors where results are everything and failure is simply not on the menu. Pavel has, frankly, done the research for you... plundering both the classic and the little-known strength texts from past and present... networking and comparing notes with many of today s great masters... submitting his own body to the pain of infinite experiment. And Pavel has trained thousands of troops and police whose life might depend on his tips... hundreds of athletes and martial artists with the chance to achieve their dreams thanks to his advice. And of course, tens of thousands have gone to the dragondoor.com strength forum to share the astonishing gains and results they have achieved by employing Pavel s strength advice... In Beyond Bodybuilding, you get the essence of most-all of the strategies, tips, routines and fine points Pavel has developed over many, many years for these elite men and women of the strength game. Now, with Beyond Bodybuilding, there are simply no more excuses for not excelling in strength, continuing to gain, continuing to reach new heights in your performance. 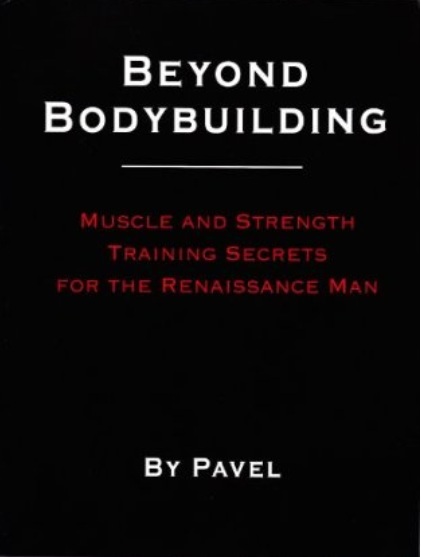 Beyond Bodybuilding Muscle and Strength Training Secrets for the Renaissance Man by Pavel Tsatouline Fast Download via Rapidshare Hotfile Fileserve Filesonic Megaupload, Beyond Bodybuilding Muscle and Strength Training Secrets for the Renaissance Man by Pavel Tsatouline Torrents and Emule Download or anything related.